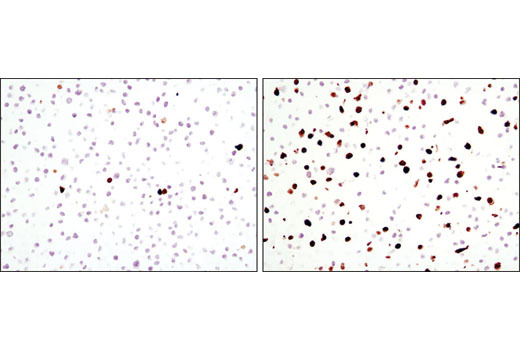 Immunohistochemical analysis of paraffin-embedded Jurkat cell pellets, untreated (left) or etoposide-treated (right), using Cleaved Caspase-3 (Asp175) (D3E9) Rabbit mAb on SignalSlide® Cleaved Caspase-3 (Asp175) IHC Controls #8104. 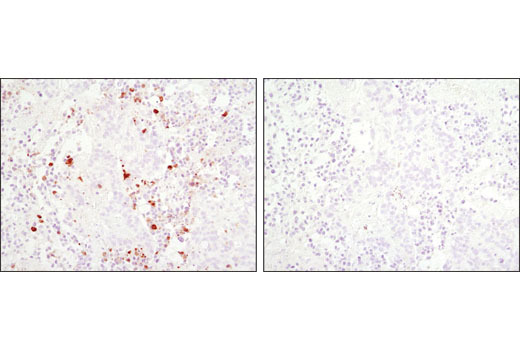 Immunohistochemical analysis of paraffin-embedded HT-29 xenograft using Cleaved Caspase-3 (Asp175) (D3E9) Rabbit mAb in the presence of control peptide (left) or Cleaved Caspase-3 (Asp175) Blocking Peptide #1050 (right). 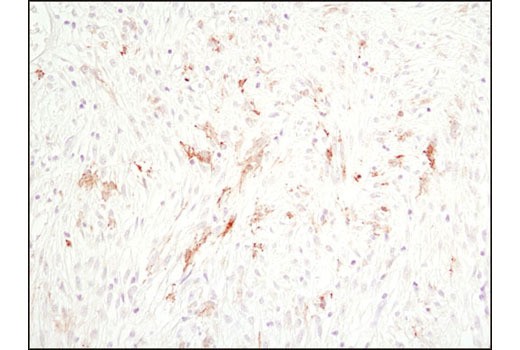 Immunohistochemical analysis of paraffin-embedded human malignant stromal tumor using Cleaved Caspase-3 (Asp175) (D3E9) Rabbit mAb. 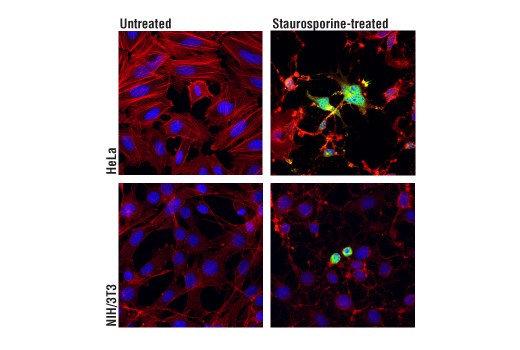 Confocal immunofluorescent analysis of HeLa (upper) and NIH/3T3 (lower) cells, untreated (left) or treated with Staurosporine #9953 (1 μM, 4 hr; right), using Cleaved Caspase-3 (Asp175) (D3E9) Rabbit mAb (green). Actin filaments were labeled with DY-554 phalloidin (red). Blue pseudocolor = DRAQ5® #4084 (fluorescent DNA dye). Flow cytometric analysis of Jurkat cells, untreated (blue) or etoposide-treated (green), using Cleaved Caspase-3 (Asp175) (D3E9) Rabbit mAb. Cleaved Caspase-3 (Asp175) (D3E9) Rabbit mAb recognizes endogenous levels of caspase-3 protein only when cleaved at Asp175. This antibody is preferred for immunofluorescence, flow cytometry, and immunohistochemistry applications. This antibody detects non-specific caspase substrates by western blot. Non-specific labeling may be observed by immunofluorescence in specific sub-types of healthy cells in fixed-frozen tissues (e.g. pancreatic alpha-cells). Nuclear background may be observed in rat and monkey samples. Monoclonal antibody is produced by immunizing animals with a synthetic peptide corresponding to residues surrounding Asp175 of human caspase-3 protein.